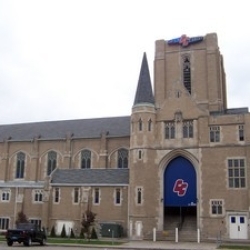 iLounge is located in the basement of Clutch Cargo's, that famous live music venue and club that's located in an old church in Pontiac. We dig the logo of iLounge... it looks like that familiar restroom sign but instead of the guy or the chick standing there all uptight, they're sitting down, chillin', enjoying the vibe of the lounge. And that's exactly what you'll be doing when you walk through those doors. The ambiance is upscale, and you will want to stick to that dress code (see clutchcargos.com for complete info) if you want to get in and stay in! The specialty drink here is a chocolate martini, which they're happy to do for you in either milk chocolate or white chocolate. That's always a hit with the ladies. The music that's piped through this cozy nightspot is mostly electronica with a little top 40 mixed in for flavor. The furnishings are all suede and leather which just adds even more luxury to this already luxurious space. Open on Fridays and Saturdays only, you can find this little gem inside of Clutch Cargo's on Huron Street just west of Woodward.